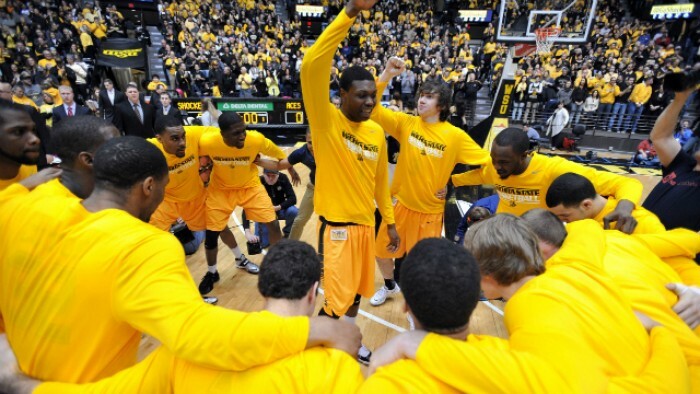 The team huddles up before a game at Charles Koch Arena. Photo courtesy of Peter G, Aiken/USA TODAY Sports. Ron Baker and Fred VanVleet had outstanding careers at Wichita State and sadly, their time as Shockers has come to an end. But the Shockers will still compete in the Missouri Valley Conference next season. Unfortunately for Wichita State basketball fans and just college basketball fans in general, the Fred VanVleet and Ron Baker era at Wichita State is over. Their run ended last Saturday in a 65-57 loss in the Round of 32 to the Miami Hurricanes. But just because VanVleet and Baker will not be on the team next year, doesn’t mean the Shockers won’t contend next year. This article will reflect on the accomplishments of both Baker and VanVleet but also a look into the 2016-17 season for the Shockers. Coming out of high school, Fred VanVleet was not a highly touted prospect. He was rated as a three star recruit by Rivals and then chose Wichita State over Colorado State in the end. The Scott City, KS native Ron Baker would also join VanVleet. But what would almost immediately come in that season when they both arrived would be nearly unheralded. The Shockers exploded onto the scene, starting the season 12-1 in out of conference play including wins over Iowa and VCU. Wichita State then concluded the regular season by going 12-6 in conference play. In the conference tournament, the two seed Shockers reached the MVC Championship. But they were upended 68-65 by the Doug McDermott led Creighton Blue Jays, who were also the one seed in the tournament. On Selection Sunday, the Shockers were selected as a nine seed in the NCAA Tournament. In the opening round, the Shockers were pinned up against the eight seed Pittsburgh Panthers. But the Shockers blew right passed Pitt, winning 73-55 and advancing to the Round of 32 to take on the one seed Gonzaga. In a game when no one thought the Shox had a chance, they came out swinging. The Shockers jumped out in front and had a tip in buzzer beater to lead 36-31 at the half. But the Zags pulled ahead by four late in the game. But the Shockers regained the lead by one, and then went on a 12-7 run to end the game and upset #1 Gonzaga 76-70 to advance to their first Sweet 16 since 2006. Then the Shockers faced an unlikely opponent in the Sweet Sixteen. That would be 13-seed La Salle. After struggling in the first half, the Shockers pulled away in the second half, and win it 72-58. The Shockers were headed to the Elite Eight for the first time in over 30 years. It would not come easy, as the Shockers would face two seed Ohio State. But Ohio State stormed back, narrowing the deficit to three at 62-59. But Tekele Cotton of Wichita State would nail a three with just over two minutes remaining and the Shockers would never look back. Georgia Dome, here they come. Wichita State took on the one seed Louisville Cardinals in the Final Four in Atlanta, Georgia. From the opening tip, a majority of the viewers thought Wichita State was going to be headed to the National Championship. They held the lead for a majority of the game and had a two-point lead with just six minutes remaining. But powerhouse Louisville just proved to be too much, and escaped a Shocker upset, beating them 72-68. Louisville also went on to win the National Championship, beating the Michigan Wolverines in the title game. Unfortunately the Shockers didn’t make it all the way but nonetheless, defied the odds by making it to the Final Four as a nine seed and also being a mid-major school. After this run to the Final Four, expectations would go nowhere but up from there on out for Wichita State. What the Shockers would accomplish this next season in 2013-14 would be nothing short of amazing. Wichita State breezed through out of conference play, going 13-0 and notching wins over BYU, Davidson, SLU, and Alabama amongst others. MVC conference play was a breeze as well, for the most part. They went 18-0 in conference play. The closest the Shockers came to a loss was a game on the road against the Missouri State Bears, where MSU took the Shox to overtime but WSU prevailed and won the game 72-69. In the conference tournament, Wichita State ran the table, defeating Evansville, Missouri State, and then Indiana State in the championship. The Shockers averaged a 20.3-point win margin in the tournament. So the Shockers were 34-0 and sat at #2 in the college basketball rankings. Their impressive season landed them a one seed in the 2014 NCAA Tournament. In the opening round, Wichita State easily took down 16 seed Cal Poly, beating them 64-37. But in the round of 32, the Shockers ran into the Kentucky Wildcats, a team that even UK head coach John Calipari admitted were miss-seeded. Wichita State trailed early on, but thanks to a defensive effort by Fred VanVleet and then an incredible offensive performance by Cleathony Early, the Shockers gained the lead and led 37-31 at the half. Late in the game, Ron Baker and Early hit clutch three pointers, putting the Shox up five with four minutes remaining. Later on down one, James Young of Kentucky would connect on a three to put Kentucky up 73-71 with 1:37 remaining in the game. Then with thirty seconds left, Baker banked in a three pointer to put the Shockers within one. Wichita State had the ball with 3.2 seconds remaining and called a timeout. On the inbound play, the ball was passed to Fred VanVleet who put up a potential game winning three but he had too much on it and the shot was no good. Season over. Despite last season letdown against Kentucky, Baker, VanVleet, and Wichita State were still a quality team and were expected to do big things. The Shockers had graduated several seniors but still had the core of VanVleet, Baker, and Evan Wessel. Right out of the gate, the Shockers were nearly perfect in out of conference play. Wichita State went 10-2, suffering losses to only Utah by one in overtime and then a six-point defeat at the hands of George Washington. The Shockers then only suffered one blemish in conference play, going 17-1 and losing to Northern Iowa on the road. In the MVC tournament, the Shockers defeated Southern Illinois by double figures in the quarterfinals but were upset 65-62 in the semifinals by Illinois State. Nonetheless the Shockers still received a bid in the NCAA Tournament, this time as a 7 seed. In the first round against 10 seed Indiana, the Shockers fought back and forth and pulled away in the end, winning the game 81-76. In the second round, Wichita State met two seed and fellow in-state team Kansas. This was the first time the Shockers and Jayhawks played each other since 1993 and the second time the two foes had ever faced off in the big dance. The last time the two met in the NCAA Tournament was back in 1981, when Wichita State beat Kansas 66-65 to advance to the Elite Eight. In this matchup, it was a back and forth, grind it out type game in the first half as anticipated. The Shockers led 29-26 at the break. The second half was a complete different game, as Wichita State’s offense was on fire. The Jayhawks had no answer and it was too little, too late for the Jayhawks on offense. Wichita State would prematurely end Kansas’ season, beating them 78-65 to advance to the Sweet 16 for the second time in three years. But in the Sweet Sixteen, the Shockers ran into the three seed Fighting Irish of Notre Dame. The Shockers couldn’t handle the pressure early on, and trailed Notre Dame 20-7 six and a half minutes into the game. Wichita State would fight back though, and only trailed by three at the half, 33-30. The Shockers took an early lead in the second half at 38-37 but shortly after, it was all Irish. Notre Dame went on a 17-8 run to regain the lead and they wouldn’t relinquish it, eventually winning the game 81-70 and ending the Shockers season. It was finally Baker, VanVleet, and Wessel’s senior year. Expectations were once again high and there was for every reason for it. The Wichita State Shockers had been to the NCAA Tournament four years in a row now and asserted itself as a mid-major powerhouse in the NCAA. But injuries derailed the Shocker train early on. The Shockers went a horrific 6-5 in out of conference play. Now some might say that record isn’t too bad. But seeing what they’ve done in out of conference play in the previous few seasons, it was completely uncharacteristic of them to do as bad as they did in out of conference play. However four of their five out of conference losses came against teams that later on made the NCAA Tournament. Wichita State got healthier and stepped up their game in conference play. They finished conference play 16-2 with the only blemishes coming in a road loss against the Illinois State Redbirds and a game at home against eventual MVC tourney champs in the Northern Iowa Panthers. Then in the MVC tournament, Wichita State escaped Loyola (CHI) in the quarterfinals but then was upended in overtime by Northern Iowa in the semifinals. Wichita State wasn’t a totally guarantee to make the tournament. Shocker players, coaches, and fans alike were sweating it out on Selection Sunday but the Shockers were chosen as an 11 seed and were to play a game in the First Four against the Vanderbilt Commodores in Dayton, Ohio. In that First Four matchup, the Shockers and Commodores traded blows and went to the half tied. But Wichita State pulled away in the second half and ended the game on a 20-2 run to win the game by 20. Wichita State moved on to play the six seed Arizona Wildcats in the round of 64. The Shockers had the best defense in the nation in terms of points per game. That defense proved that it was stellar, as it held Arizona to just 19 points in the first half and led it 31-19. The Wildcats offense would come alive in the second half, outscoring the Shockers 36-34 but it wasn’t enough, as the Shockers would win it 65-55. In the second round, Wichita State would see the three seed Miami Hurricanes. And boy, did it turn ugly quickly. The Hurricanes jumped out to a 27-6 lead early on behind the antics of Angel Rodriguez who was in double figures in points just minutes into the game. The Shockers wouldn’t go down without a fight though, and narrowed the deficit to 13 as they trailed 32-19 at half. It was a tough half for Shocker fans to watch. But in the second half, the Shox had all fans on their seats as Miami’s lead dropped to single digits. But Ron Baker nailed a three to give the Shockers a one-point lead with 10 minutes remaining. But Miami stormed back and took the lead. The Shockers went cold on offense and struggled to stay in it. Miami pulled away and won the game, 65-57, ending the careers of the big three in Ron Baker, Fred VanVleet, and Evan Wessel. Take a look at the emotional press conference of Baker, VanVleet, and coach Gregg Marshall after the loss to Miami. Specifically Fred VanVleet and Ron Baker left lasting legacies at Wichita State. They combined for over 7,000 total points in their four years en route to having a 119-23 overall record. That record included four straight NCAA Tournament appearances, one Final Four Appearance, two Sweet Sixteen appearances, three straight regular season MVC titles and one MVC tournament championship. With Baker and VanVleet on the team, the Shockers managed a 9-4 record in the NCAA Tournament. Despite both of them graduating, the Shockers have a bright future. Fred VanVleet, Ron Baker, Evan Wessel, Anton Grady, and Tom Wamukota are all graduating and will not be back with the team next season. Despite the graduates moving on, the Shocker faithful have plenty to look forward to. The team will retain starters forward Zach Brown and center Shaquille Morris, who will both be juniors in the fall (Shaq is redshirted). Looking at the other players who could be starters next season, Conner Frankamp is a leading candidate for starting shooting guard, as he was the teams three point specialist this past season who came off of the bench. Frankamp will be a junior. 6’8” forward Markus McDuffie will likely be the teams’ starting power forward, he saw significant time off of the bench in 2016. McDuffie will compete with Rashard Kelly for minutes. The point guard position is truly intriguing heading into next season. It will likely be a battle between Peyton Allen, a transfer from Texas A&M who sat out the 2015-16 season, Landry Shamet, John Robert Simon, or incoming transfer Daishon Smith. Now those aren’t the only options but the battle for starting point guard is open for the taking by anyone and it will be interesting to see how the battle unfolds before or during the 2016-17 season. Despite losing key players, the Shockers will compete in the MVC once again next season.